Dictionary.com defines "independence" as freedom from control, influence, support, aid, or the like, of others. It gives "freedom" as a synonym. What is "freedom"? It is defined as being "exemption from external control, interference, regulation...and the list goes on". Among its many definitions are also, "a liberty taken" and "civil liberty, as opposed to subjection to an arbitrary or despotic government". Dictionary.com also lists the synonyms "freedom", "independence", and "liberty" as referring to an absence of undue restrictions and an opportunity to exercise one's rights and powers. It says that "independence" implies not only lack of restrictions, but also the ability to stand alone, unsustained by anything else. I think understanding the definitions of these words is important. No, I think it's vital. Far too many have given up their liberties, their freedoms, and their independence for dependence on our government. And they like it that way. Many would like more dependence on our government through government health care and/or insurance, government control of banks and auto companies, and government oversight of anything the government can find to regulate. This is not the country our founding fathers intended for us to have. This is not the country many fought and died for. I'm reminded of the words of Benjamin Franklin, "He who would give up essential liberty for temporary security deserves neither and will lose both." When most of us think of July 4th, we think grilled hot dogs, potato salad, and fireworks. Is that what the Founding Fathers thought of when they celebrated July 4th? Were they thinking of fireworks as a way to have fun with their family? Or did they have a long, hard fought battle for independence from Britain on their minds? 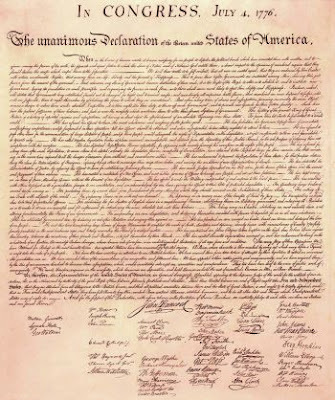 On July 4, 1776, the Continental Congress ratified the Declaration of Independence. It was the start of our nation. The start of our freedom. The start of our independence from an overbearing government who made decisions on behalf of the States without proper representation. What happened? Do we still have that freedom? That independence? Are we properly represented now? I know we HAVE representatives, but are they truly representing us? Resolutions are put before Congress, the public demands they be voted down, and then they pass? That doesn't sound like true respresentation to me. In the spirit of commemorating that day 237 years ago, I'd like to deliver a Declaration of my own to the United States government. I can't take credit for this Declaration, though. It was written 237 years ago by Thomas Jefferson on my behalf. Only now, I'd like to ask the United States government; regardless of party, to take it as a letter THEY need to heed. They need to look at this and remember why our country was created. Why our independence was sought. And what the grievances were against the British government. They need to remember what the States were seeking when they declared independence. They didn't want to break off from Britain, but they found they had no choice after fighting and trying for years to obtain proper representation for the States. This Declaration was not made lightly. They deliberated and fought among themselves before they finally agreed to declare their independence. They did so only because they truly felt like they had no other choice. They had tried many times to resolve their differences peacefully. I'd like the current United States government to note that we, as the American people, are trying to peacefully resolve our differences with them. We are desperately screaming out for them to listen! We want them to hear that our government has gone astray and we need to do something NOW...before it's too late. Please, take a moment from your fireworks today and think about that first July 4th. Then, think about where we are now. Think about what will happen if we do not restore the proper balance of power to our government...and quickly! **He has refused his Assent to Laws, the most wholesome and necessary for the public good. **He has forbidden his Governors to pass Laws of immediate and pressing importance, unless suspended in their operation till his Assent should be obtained; and when so suspended, he has utterly neglected to attend to them. **He has refused to pass other Laws for the accommodation of large districts of people, unless those people would relinquish the right of Representation in the Legislature, a right inestimable to them and formidable to tyrants only. **He has called together legislative bodies at places unusual, uncomfortable, and distant from the depository of their public Records, for the sole purpose of fatiguing them into compliance with his measures. **He has dissolved Representative Houses repeatedly, for opposing with manly firmness his invasions on the rights of the people. **He has refused for a long time, after such dissolutions, to cause others to be elected; whereby the Legislative powers, incapable of Annihilation, have returned to the People at large for their exercise; the State remaining in the mean time exposed to all the dangers of invasion from without, and convulsions within. **He has endeavoured to prevent the population of these States; for that purpose obstructing the Laws for Naturalization of Foreigners; refusing to pass others to encourage their migrations hither, and raising the conditions of new Appropriations of Lands. **He has obstructed the Administration of Justice, by refusing his Assent to Laws for establishing Judiciary powers. **He has made Judges dependent on his Will alone, for the tenure of their offices, and the amount and payment of their salaries. **He has kept among us, in times of peace, Standing Armies without the Consent of our legislatures. **He has affected to render the Military independent of and superior to the Civil power. **He has abdicated Government here, by declaring us out of his Protection and waging War against us. **He has plundered our seas, ravaged our Coasts, burnt our towns, and destroyed the lives of our people. **He is at this time transporting large Armies of foreign Mercenaries to compleat the works of death, desolation and tyranny, already begun with circumstances of Cruelty & perfidy scarcely paralleled in the most barbarous ages, and totally unworthy the Head of a civilized nation. **He has constrained our fellow Citizens taken Captive on the high Seas to bear Arms against their Country, to become the executioners of their friends and Brethren, or to fall themselves by their Hands. **He has excited domestic insurrections amongst us, and has endeavoured to bring on the inhabitants of our frontiers, the merciless Indian Savages, whose known rule of warfare, is an undistinguished destruction of all ages, sexes and conditions. Signed by 56 brave men. Full list of signatures can be found here.